I went 2 and 2 last week missing the 2 AFC games and I got 2 requests for updated predictions for this weeks games so I am actually posting the charts for game time of all 4 games [ give or take a minute ]. I’m still taking the 4 teams I had winning originally in this round to win still but I thought I’d give a little additional info to the games. In Football Saturn is offense [ strategy ] and Uranus is Defense [ creating chaos ] so that’s some of what I’ll be using to predict the scores. Above is the chart for the Saints- 49ers on Saturday. Venus recently into Pisces and Neptune conjunct in the 10th house looks for a game that could favor the underdog but also look for deception , trickery or a mental lapse or error being important in the game. 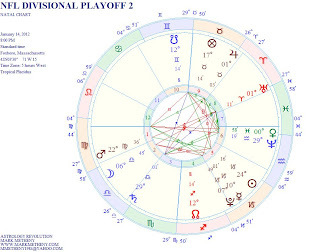 Near the end of the game Mercury and Pluto should be on the midheaven of the game chart and Uranus close to the ascendant so I would expect lots of excitement late. 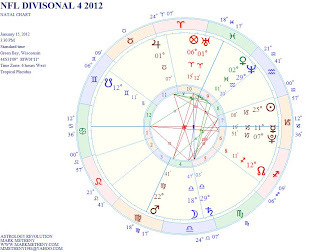 I would think that it will take some key strategy and leadership [ Capricorn] to take control of the game late. I expect the Saints to win but I think the 49ers will be in the game the whole way but the Saints are too powerful. Gemini in the first House to start game , Gemini ruler Mercury is conjunct Pluto I like that to favor the favored Saints.The Moon is conjunct the 49ers Neptune and the Saints Mercury I like those to favor the Saints decision making. I’m taking the Saints 31-19. This is the second game Saturday . The fighting Tebow’s vs. the Patriots. Denver is the only team with a winning record vs. the Patriots since 2000. Strangely enough these 2 teams have the sane Birthday as they played each other in their initial games on September 9th 1960 so it’s almost like the Broncos have an immunity to the Patriots wiley tricks. 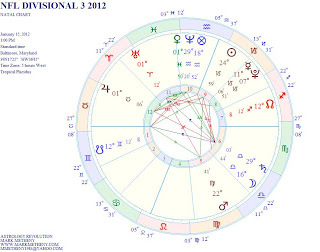 Pluto will be approaching the Descendant , Mars in the third and Uranus in the 9th as the game ends. The teams charts are useless as they are exactly the same here. Mars is in first house as game starts I like that to favor Patriots as they are the favorite and the home team. Pats eventually 34-23. 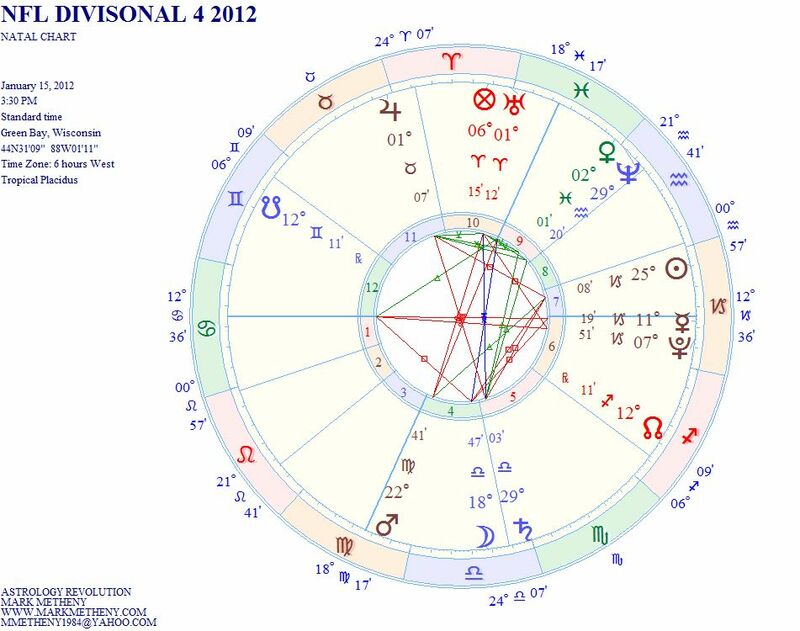 Venus just recently into Pisces sits on the MC as the game starts as does Neptune. This features the underdog early. 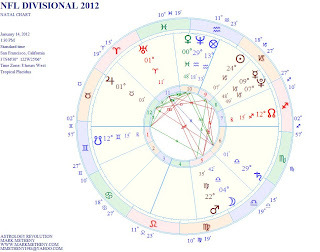 The Sun in Capricorn sits on the MC as the game ends . 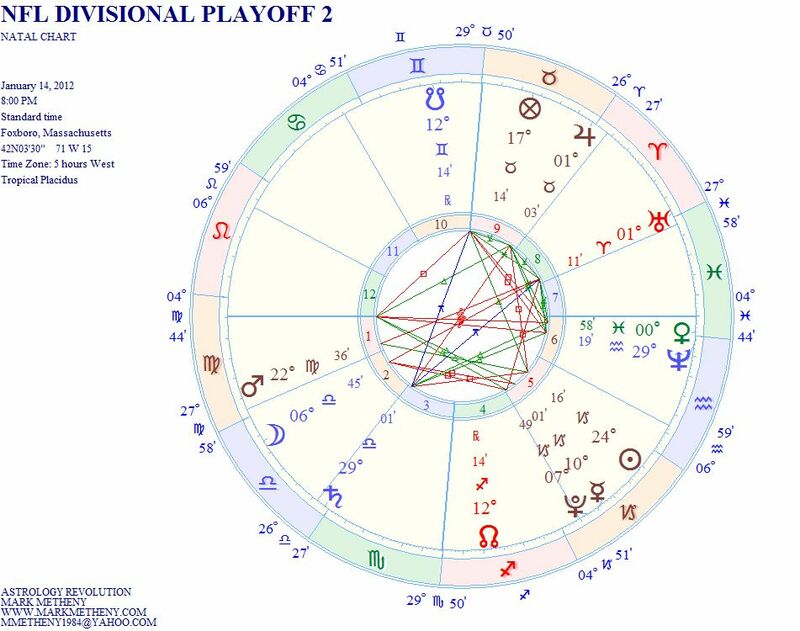 The Moon in Libra favors balance and a close game.North Node is in 7th and it’s ruler is Jupiter is in 12th that could mean trickery or lack of energy for Texans. The Moon is conjunct Ravens chiron and North Node and it is past the Texans Libra Moon. I like the Texans to hang very tough but the Ravens come out the victor 24-16. Uranus in the10th to start this game expect lots of excitement early. Moon still in Libra so I expect it to be a close back and fourth game . Mars is getting ready to make a station next week and is starting to slow down. 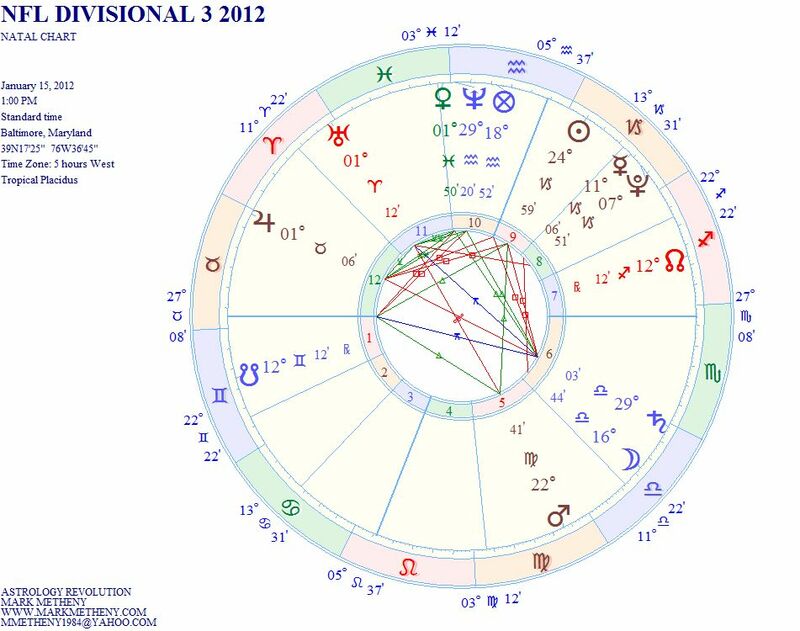 The Giants will be a handful but the Moon has past the Giants Mars and transiting Mars is almost on top of the Packers Natal Mars. Packers 34-28.